Science, Technology, Engineering, Art, and Math (STEAM) programs at Boston Children’s Museum are designed to create playful and surprising “a-ha” moments for children and families—the types of experiences that ignite a curiosity and excitement that can last a lifetime. Whether children are designing miniature houses from cardboard, building circuits, painting with natural dyes, or getting to know a live animal, STEAM activities foster children’s curiosity, creativity, and learning as they try things and explore the world around them. STEAM programming includes experiences like tinkering with circuits and art materials to design a glow bug, working as a team to program a robot, collaborating with a community artist to make a sculpture, creating with art mediums from clay to fabric to paint, or giving feedback to a professional inventor on her new technology. While our programs may emphasize one or more of the STEAM disciplines, our overarching goal is to offer joyful, multi-sensory STEAM experiences that help children build STEAM habits of mind. Museum exhibits also support STEAM habits of mind, including Investigate, Bubbles, and Construction Zone, and further encourage imaginative learning in fun environments. 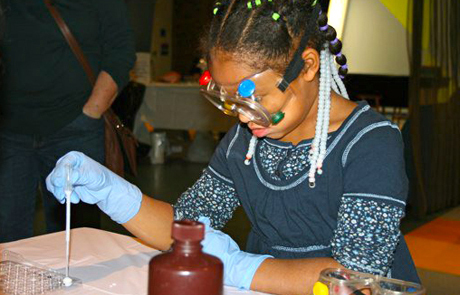 Special monthly programs, such as Kitchen Science and Critter Days with Live Animals, and annual events, including National Engineers Week and Chemistry Day, are also regularly offered at the Museum. Check the calendar for a list of upcoming STEAM programming. Come meet inventors, innovators, and high-tech tinkerers through the Museum’s dynamic new Tech Kitchen program. We host everyone from entrepreneurs to established tech companies as they prototype, experiment, and test their newest tools and gadgets. Past innovators have presented video games, robots, state-of-the-art building blocks, kid-friendly apps, and more. These programs offer a fun way for children and grown-ups to engage with members of Boston’s technology community, learn about real-world STEAM applications, and explore something new together! Interested in being one of our Tech Kitchen presenters? Click here to apply today! Tech Kitchen is generously supported by National Grid and BNY Mellon. Young children naturally engage in science, technology, engineering, art, and math as they interact with our world. They play with flashlights and notice shadows, build bridges out of blocks so a toy car can drive across, and mix paint to produce brand new colors. Museum programs and exhibits engage children in the excitement of STEAM discovery and learning by offering unique opportunities to question, wonder, experiment, and create. The Museum presents STEAM as an integrated whole because we believe that the habits of mind—the ways of thinking—that children can develop by inventing, exploring, and creating apply across the STEAM disciplines. By offering STEAM activities at Boston Children’s Museum that allow for rich interactions with family members, museum staff, and other visitors within our collaborative and creative STEAM learning environment, we strive to support and foster the future innovators, creatives, problem solvers, and curious minds of the future. STEAM experiences often involve making something—a work of art, an invention designed to solve a problem, an experiment to investigate a question. The technologies we use during STEAM activities, from crayons and paper to magnets and robots, can spur creative thinking, help build vocabulary, and support problem solving skills. The skills children use in the process of making something—fine motor skills like cutting and hammering, math skills like assessing area and shape, and planning how to go from concept to product—support critical thinking and cognitive development. The “Maker Movement” began in the early 2000s as a grassroots movement of do-it-yourself hobbyists joining together to share the things they like to make, which includes anything from robots to origami to art to wood crafts to food, and beyond! Since 2016 the Museum has hosted the Boston Mini Maker Faire, a celebration of the creativity and rewards of making. Throughout the year, we offer STEAM programming that often incorporates the idea of making in ways that are age-appropriate for our visitors. We embrace the notion that our visitors can benefit from access to and experience with both high- and low-tech tools. In introducing circuits, LEDs, hammers, and paintbrushes to our visitors, we are encouraging them to try new things and gain confidence in their abilities to make whatever they can imagine! Art reflects a spirit of creativity intrinsic to our STEAM philosophy. Visitors to the Museum can engage in a variety of art and design activities. The Museum develops engaging art activities and collaborates with talented artists to facilitate experiences that engage both children and adults in artistic expression. Visitors might be invited to explore clay, paint, sound, or fibers as they participate in creative exploration and the process of making art. The curiosity and generative thinking fostered through art also nurtures design skills key to apply in STEM challenges. When soldering a pendant or building a robot, art and design thinking can influence both form and function. Art and design skills are also encouraged through open-ended STEAM challenges that involve investigation, trial and error, playful experimentation, and perseverance. The A in STEAM invites visitors to observe, ask questions, make connections, and push the boundaries of their imagination as they engage in creative problem solving.